When Webstrian will initially create your website, you will get a set of predefined pages which can be changed or edited through the administrative panel. 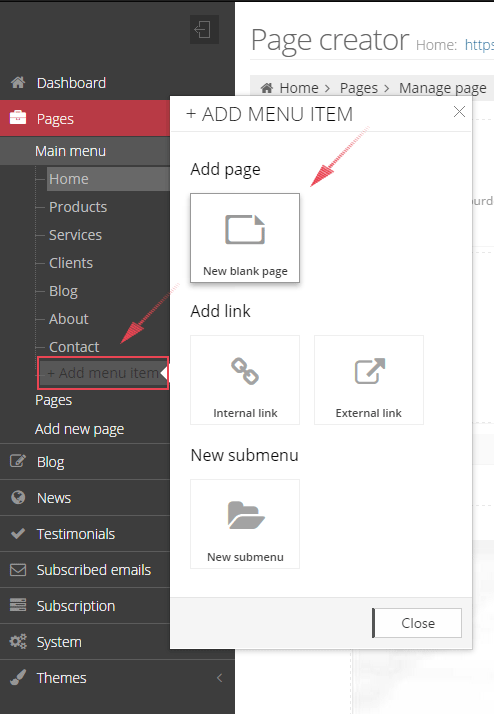 Click on the “Add new page” link located on the left menu of your administrative panel (Method 1) or add a new page with a click on the "Add item" link and then by clicking "Blank page" link (Method 2). The difference is that in the second case, the new web page automatically will be added to the main (navigation) menu. 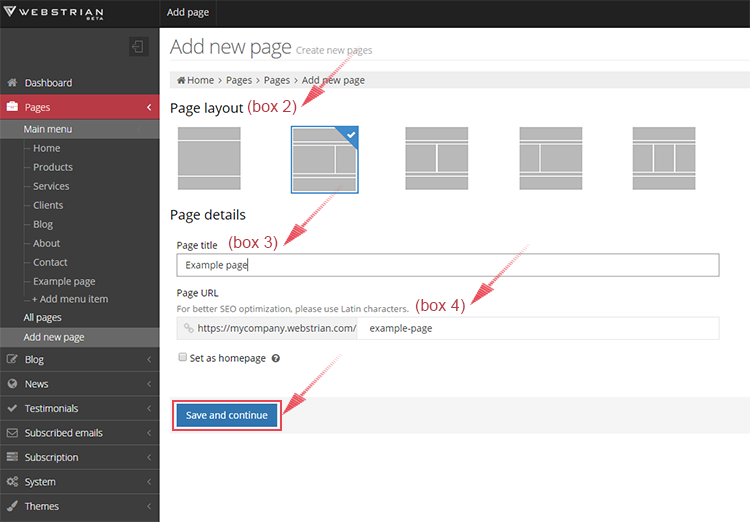 Select the structure of the new page in the new window that will be opened (Box 2). Enter the title for the page (Box 3). The Internet address or the URL that will appear into the browser‘s address bar will be filled automatically according to the name of the new page. We recommend you not to change this value, but if you really need to do this (for example the title of the page is too long), then enter the new address into the URL text box (Box 4). Click on the "Save and continue" button to create your new web page. Add your content (text, images, video, etc.) to the newly created page. When you are done with the changes, menu click on the "Publish changes" button located on the right menu. This will apply the changes to the page, and it will make the changes visible to the visitors.